Kim Newman is well known as a journalist with a penchant for horror movies, and his pedigree shines through within this latest addition to his Anno Dracula series. The premise of the book is that Dracula really did exist, but left behind many vampires after he was killed. 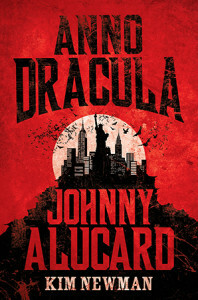 One of these is the titular Johnny Alucard – from humble beginnings in Ceausescu’s Romania where he becomes an assistant to Francis Ford Coppola on the set of his movie, Dracula, to 1970’s New York, Newman re-imagines pop history with the addition of vampires. Every notable movie character makes an appearance – from Tony Manero, to Travis Bickle, to The Dude and even Buffy the Vampire Slayer (or Barbie as she is known within these pages). Johnny Pop takes various guises and works his way up to become a genuine Hollywood mogul, all in the name of his Dark Father, Dracula. Movie buffs will love Newman’s constant nods to all things cinematic, and pop history fans will enjoy reading about Andy Warhol and his vampire cronies. Everyone else can simply enjoy turning the pages and discovering more thrills and vampire action as the novel progresses.